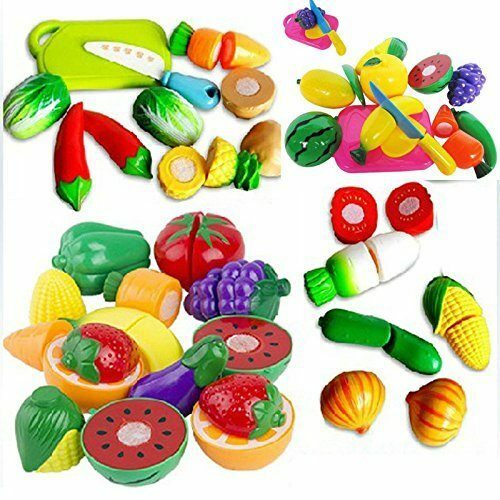 Food Cutting Playset Only $5.66 + FREE Shipping! You are here: Home / Great Deals / Amazon Deals / Food Cutting Playset Only $5.66 + FREE Shipping! Does your child have a play kitchen or are you getting one for Christmas? Check out this fantastic deal on a Food Cutting Playset – get this one for $5.66 + FREE shipping! This is expected to be delivered in January if you choose standard shipping. This set is really neat because it comes with a plastic knife so kids can practice cutting fruits and veggies. How fun is that?! My daughter would LOVE this for her play kitchen! Comes with a plastic knife for children to enjoy cutting. Each fruit and vegetable can be sliced in half because they are connected with velcro. it is an enjoyable and coordinate ability.